There isn't a girl I know that at one point in time hasn't gotten caught up in the mystical, magical world of fairies, sprites, unicorns and the like. Girls of all ages seem to love that kind of fantasy land and my daughter is no exception. Abby Cadabby is one of her favorite characters on Sesame Street and she's constantly fluttering around the house in her fairy wings while clutching her magic wand. 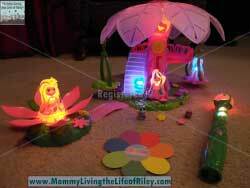 WowWee, an award-winning toy manufacturer, has recently discovered a way to bring the enchanted land of Lite-Topia to your little girl through their entire line of Lite Sprites toys. 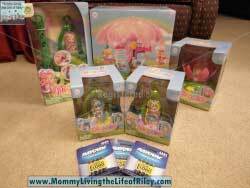 Riley and I had the chance to review five toys from this collection. Keep reading to learn more as well as enter to win a Lite Sprites set of your very own! The Lite Sprites live in Lite-Topia, an enchanted land that sparkles with color and light. The Sprites collect, share and use color and light to express their emotions. The Sprite Sisterhood includes five Sprites, each with a special power: Prisma, the leader; Astra, the keeper of the skies; Brooke, who takes care of the water; Meadow, who is responsible for the plants, flowers and trees; and Bleak, the rebel Sprite who uses her powers to disrupt color in Lite-Topia. Using the Lite Wand, girls ages 4+ can collect almost any color from nearly any flat surface in their real world environment and magically share it with the Lite Sprites and their world. 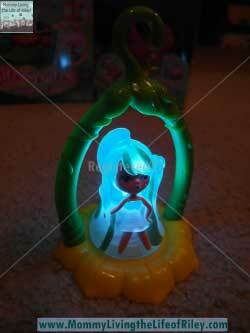 The Lite Sprites can catch color from the Wand, can share and catch color from each other, and also with the playsets. Each playset includes a path so you can collect and connect playsets to create an ever-changing world of color and light. The Lite Sprites, Astra and Brooke, each came with their own unique forest pod home which can hang from the Tree of Lite. Prisma, the leader of the Lite Sprites, cannot be purchased separately, but is only available with the Lite Wand, which also includes her forest pod home. 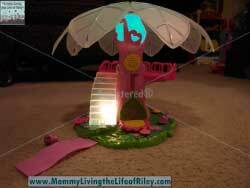 Each Lite Sprite is powered by 3 "LR44" batteries (included) and interacts with the playsets in her own special way. To play with them, turn the power switch on and press their select and share color button to cycle through each Lite Sprites favorite colors. Every one has her own favorite colors for your child to discover. After a certain period of inactivity, all Lite Sprites toys will automatically shut off so as to conserve battery power. 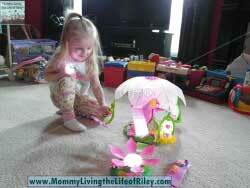 The Flower playset is one of four interactive sets in Lite-Topia. This playset is powered by 3 "AAA" batteries (not included) and comes complete with 4 interchangeable decorative flowers, a child-sized flower ring, 1 Lite Pet and 1 Path that connects other Lite-Topia playsets together to create the world of Lite-Topia. 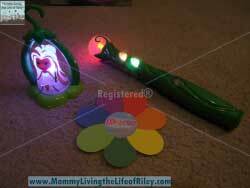 This Flower playset has the ability to recognize and respond to individual Lite Sprites with special light patterns and of course, it can catch and display color and light from the Lite Wand. 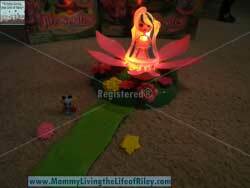 Riley really enjoyed the Flower playset, for when you pressed down on the flower's middle, the petals folded up, enclosing the Lite Sprite within. When the button on the playset was pushed, the petals came down and the colors changed too. 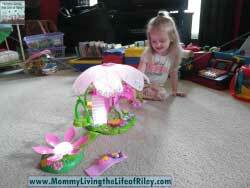 She also enjoyed rearranging the decorative flowers and putting the Lite Pet on the path. The Lite Wand, in my opinion, was the coolest component of the Lite Sprites toy set and the one that Riley seemed to enjoy the most. The Lite Wand allows you to select color from the built-in library and share it with Prisma and the rest of Lite-Topia with just the press of a button. It even works to change the other toys from over 6 feet away! What's more, you can actually capture color from your own world and save it inside the Lite Wand to then transfer to the other items in Lite-Topia. This amazed me the most, for I would put the Lite Wand next to my skin, my clothes, etc. and it would always pick up the color! Two wands can even work together and give and receive color from each other. The Lite Wand uses 4 "AAA" batteries (not included) and even has two colorful games your little girl can play, called Color Hunt and Color Mix. 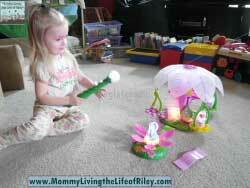 Riley had a blast with the Lite Wand and ran around the house saying "Magic, magic, magic!" before trying to change the color of Lite-Topia, her other toys, the dog and even her father and me! We were both fascinated by how neat the Lite Wand truly is! Last and definitely not least, was the Tree of Lite itself. This central component to Lite-Topia uses 4 "AAA" batteries (not included) and comes complete with 4 interchangeable decorative flowers, 1 Lite Pet, 1 Path that connects with other Lite-Topia playsets and 1 child-sized flower ring. The Tree of Lite has a frosted canopy which can catch and display color and light from both the Sprites and Lite Wand. There are four hooks included on the canopy so that four of the forest pods can hang from it. The canopy actually twirls around when the child spins it while music plays and light is shared with the Sprites and other playsets. This tree also includes a lighted staircase and kid-powered elevator which will hoist the Lite Sprites up to the balcony area. This area holds up to four sprites. I thought that the Tree of Lite was extremely cool and beautiful to look at. Riley loved playing with this entire set and spent the better half of the last three days doing so. 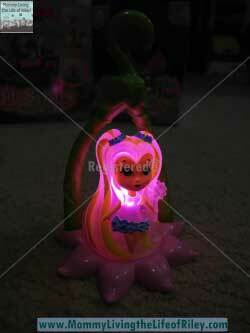 Disclosure: I received the five Lite Sprites toys shown above from WowWee in order to facilitate my review. No other compensation was received. This product review is based on my own personal experiences with this item and is completely honest and objective.